Appleton Attorneys Michael S. Siddall and Charles D. Koehler have been invited to join the Fellows of the Wisconsin Law Foundation honorary program. Herrling Clark Law Firm, Ltd., located in Appleton, Wisconsin, is proud to announce that Michael S. Siddall and Charles D. Koehler have been invited to join the Fellows of the Wisconsin Law Foundation honorary program. Since 1999, the invite-only Fellows of the Wisconsin Law Foundation has honored and recognized members who have attainted high professional achievement within their respective practice area. Members of the program have also made substantial contributions to the expansion and improvement of the administration of justice in Wisconsin. Fellows are also acknowledged for their devotion to the legal profession with regards to their local community. Appleton Personal Injury Attorney Michael S. Siddall is a shareholder with Herrling Clark Law Firm, Ltd. and has been with the firm since 1974. After thirty-two years of practice, Siddall served as the firm’s president for six years. He dedicates his legal practice exclusively to personal injury cases. As an experienced litigator, Siddall has been certified as a Civil Trial Advocacy Specialist and as a Civil Pre-trial Advocacy Specialist by the National board of Trial Advocacy for over thirty years. He is rated by the National Trial Lawyers as one of the “Top 100 Trial Lawyers” and he is a “Top 50 Super Lawyer” in the state of Wisconsin. He is an active member of the Wisconsin Association for Justice, and serves on the organization’s Board of Directors. In addition to his legal practice, Siddall plays an active role within the local community by serving as a director and vice president of legal for the Make-A-Wish Foundation of Wisconsin, and he is a member and volunteer of the organization’s Field Advisory Counsel. He also serves as a director and vice president of legal of the Greater Fox Cities Area Habitat for Humanity, and he is an active member of the ABATE: Motorcycle Safety Rights Group. Appleton Attorney Charles D. Koehler has been a shareholder with Herrling Clark Law Firm, Ltd. for over 25 years. He assumed the role of firm President in 2012, following on the heels of Siddall’s service. Koehler is a veteran litigator who concentrates his legal practice in business and personal financial matters, business transactions, and municipal law. Koehler is certified by the National Board of Trial Advocacy, and he has been rated twice as one of the “Best of the Bar” by his peers within the Fox Cities Magazine. Additionally, he maintains the AV Preeminent Rating on Martindale-Hubbell, the highest attainable peer review rating. Koehler has been named a Wisconsin Super Lawyer since 2014, which places him among the top five percent of attorneys in the state. He currently serves as chairperson of District 6 of the State Bar of Wisconsin’s Fee Arbitration Program, and also serves on the Board of Directors for the Community Real Estate and Personal Property Foundation, Inc. Koehler is a member of the State Bar of Wisconsin and the Outagamie County Bar Association. 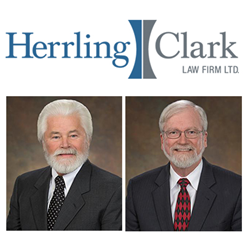 About Herrling Clark Law Firm, Ltd.
Herrling Clark Law Firm, Ltd. has served the Fox River Valley community since 1959. The attorneys at Herrling Clark have over 200 years of combined experience and the firm has been voted the “Best Law Firm in the Valley” for 12 years in a row by the Post-Crescent. Herrling Clark represents clients from four office locations throughout the state including: Appleton, Green Bay, Oshkosh, and New London, Wisconsin. To speak with a qualified member of the Herrling Clark legal team call 920-739-7366 or visit http://www.herrlingclark.com to schedule an initial consultation.